← Art of the Belly in Ocean City, MD…. Also PIRATES! When I started my freshman year of college, I took a class from Dr. Henry Parker to increase my chances of graduating. It was technically listed as a Race & Ethics class, and those topics were addressed too, but honestly it was a platform to implement his new method and companion book, Apollo vs. Dionysus: A philosophy to increase college success by 85%. As a first generation college-goer in my family, we were all really concerned if I could cut it. No one else in my family had gone straight out of high school and into college. Graduation rates of incoming college freshman in Tennessee were some of the lowest in the country. Making it the entire four years and graduating on time was my entire goal. Was I capable? So I signed up. Because I was not going to let my mother down. And I didn’t. But I’m not out to brag about that or to even sing the praises of Dr. Parker’s book and method. What I want to blog about is this one specific technique Dr. Parker taught me. And how I’m going to implement it. I’m calling this the: It will Happen Experiment. And though my ultimate goal is to become a mother, I realize now that I have to let go of the process of how it will happen. I wanted to dictate that I would begin trying to conceive in September 2011 and would have succeeded by May 2012. And, as I have lamented here before, that didn’t happen. I still want to be pregnant. I want to experience a life growing inside me. I even want the morning sickness, back pain and swollen ankles. I want all of that. But that might not be in the cards for me. I’m not giving up on it ever happening, but I’m trying to let go of the pain I associate with it. Being infertile seems like a ripoff in the game of life. As if only I could have spun an 8 I would have already been pregnant and on my way to motherhood. But instead I spun a 3. Just the luck of the draw, a random set of genetic issues giving me this makeup. And I’ve already done my time being angry and sad over it. I’ve already finished being disrespectful of my body, calling it names and cursing myself. I need to let go of that pain and start over. In this experiment I will implement the visualization methods that Dr. Parker used when I took his class so many years ago. As part of an extra credit project, every day for two weeks, we met in the basement of the dormitory and sat for 30 minutes with our eyes closed following his guided imagery. We imagined ourselves in caps and gowns. With tassels on our mortarboards, honors cords and sashes around our necks, listening to Pomp & Circumstance as we walked down a row formed on both sides by our teachers, now our peers, making our way to the stage where we would receive a small rolled up piece of paper that signified everything we were trying to accomplish. I might have graduated even without this class and guided imagery. I could have saved myself that 30 minutes everyday of those two weeks in my first semester, but why not believe that it helped me? So I will believe it. And I will implement it for this new phase in my life. I am letting go of the ‘HOW’ and instead concentrating on the ultimate goal. I didn’t spend those 30 minutes daily thinking about all the papers I would write or the hours of study that needed to be done in order to graduate. I thought only about the feeling and the experience of the graduation ceremony. And so I will do the same in my desire to be a mother. I will not concentrate on all of the transvaginal ultrasounds, the pills, the hormones, the blood work, the injections or the ultimate waiting game of adoption. Instead, I will focus on that child in my mind. He or she may be an infant, may be a toddler or even older when our goal is finally realized. I know what I want, but I also realize that I might not get it in the exact package I predict. So I am also letting go of the final form of the goal. To be a mother isn’t always being a biological mother. And you can step in to be a mother at any stage in a child’s development. It wasn’t what I had in mind, but that’s not for me to decide anymore. Instead of sending out “woe is me, I am infertile” vibes to the universe, God, etc. I will instead think of myself as a future mother. I will hold a child in my arms and he or she will call me Mom. I am also going to surround myself with images of myself with children. When I started to count them up, I actually have many pictures of me holding babies. LOL! Wonder why? I have spent a lot of time shielding myself from people who have children or are pregnant. And I’ve spent a lot of time actively avoiding mommy blogs and other baby related online content in order to protect my heart, believing that somehow not seeing babies would make it all hurt less. I even avoided movies that had parenthood related themes. But no longer. It makes me just as happy to be around children and seeing sweet, beautiful new mothers blossom as much as it makes me ache. Instead of running from that bittersweet situation, I’m going to embrace it. I’ve already spent a lot of time being realistic. It’s time to be idealistic. And I wanted something to symbolize that to me. 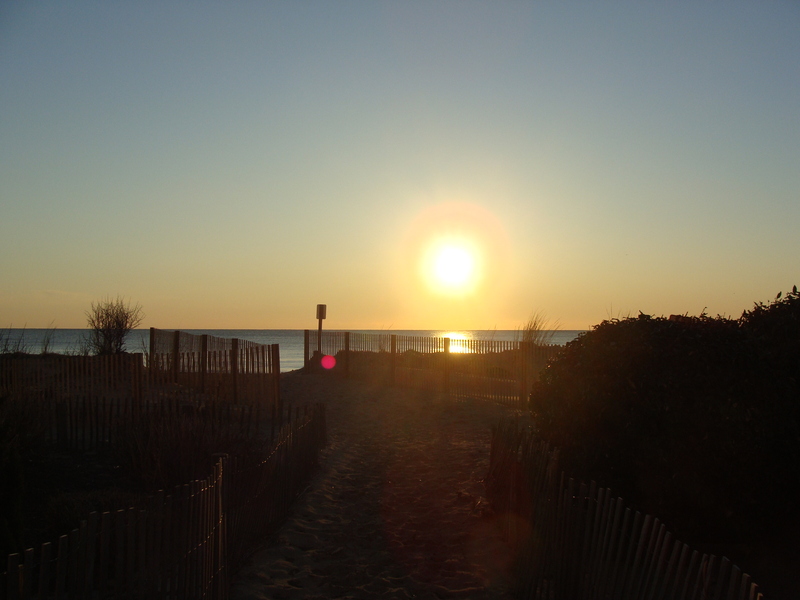 So when I set out for Ocean City, Maryland on Friday morning at 4 AM, I told myself that I will be on the beach at sunrise. And I was. And I decided that I needed a tiny ritual. A way of symbolizing to myself that I was doing something different and new. And that I was giving in to my desire for motherhood instead of pushing it away in fear of potential pain. 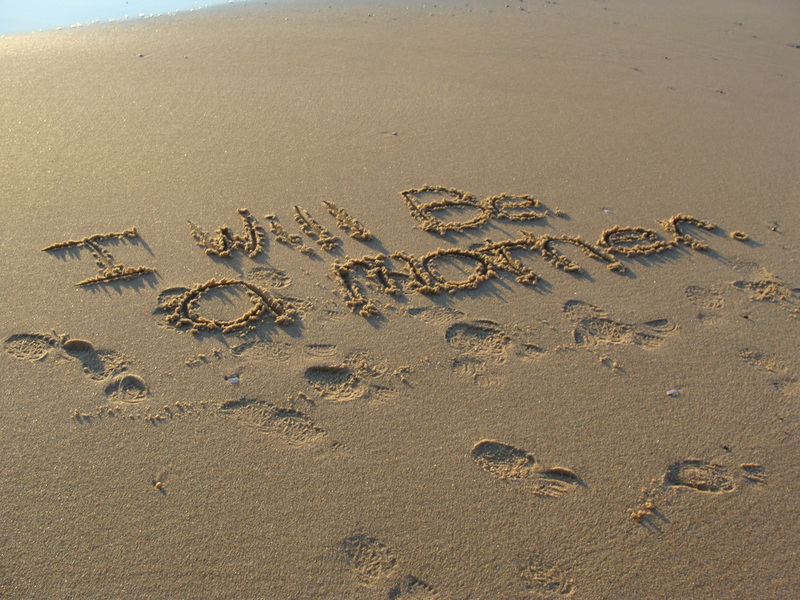 So I wrote a message in the sand, to myself, to the universe, to God, to the ocean, to whatever chose to look upon it. 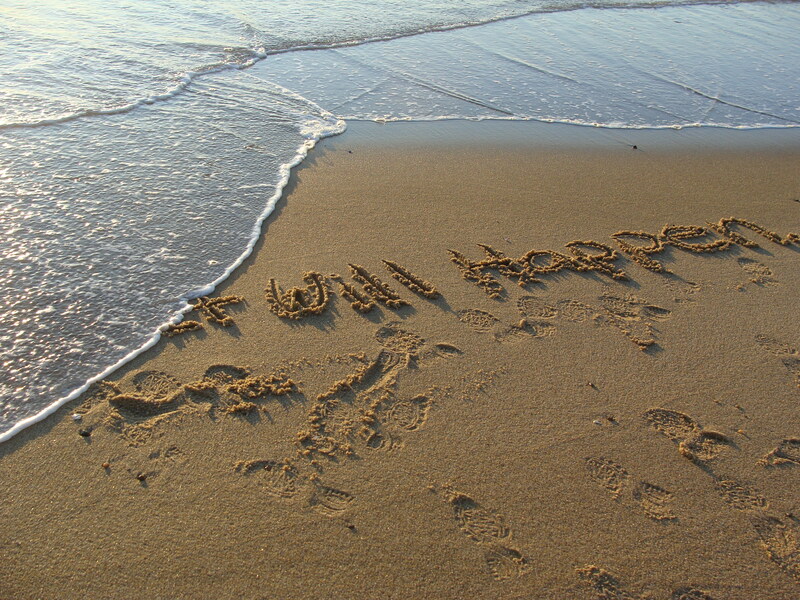 First I wrote, “It Will Happen.” And I let the ocean wash the words away until it gave me a clean slate. 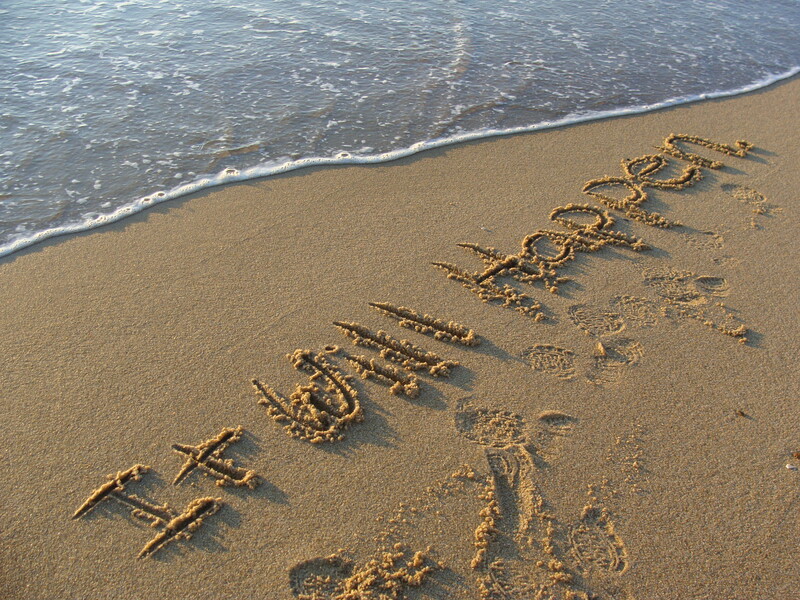 And I will be. Maybe not in the conventional sense. Maybe more like I’m the auntie to all of my friends’ children. Even though the children are adorable, and I love them all (even the ones not born yet!) that’s not ideal because they are not my own. But I will accept it. If that’s what comes of my experiment, than that’s what comes. I don’t have a set end date of the experiment. At first I thought about carrying on for 30 days. But now I think it should be open ended. I intend to set up another visit to the reproductive endocrinologist in April. That’s a very few short days from now. Then we will resume fertility treatments in May. The positive thinking is sure to be of help to me during the repeated cycles. The two week wait. The disappointment of cycle day one. And the slogging of going to the doctor’s office for the ultrasounds and bloodwork. I will visualize through all of that. On the beach Friday morning and again that night, I gave up my designs and tried to accept what will come. 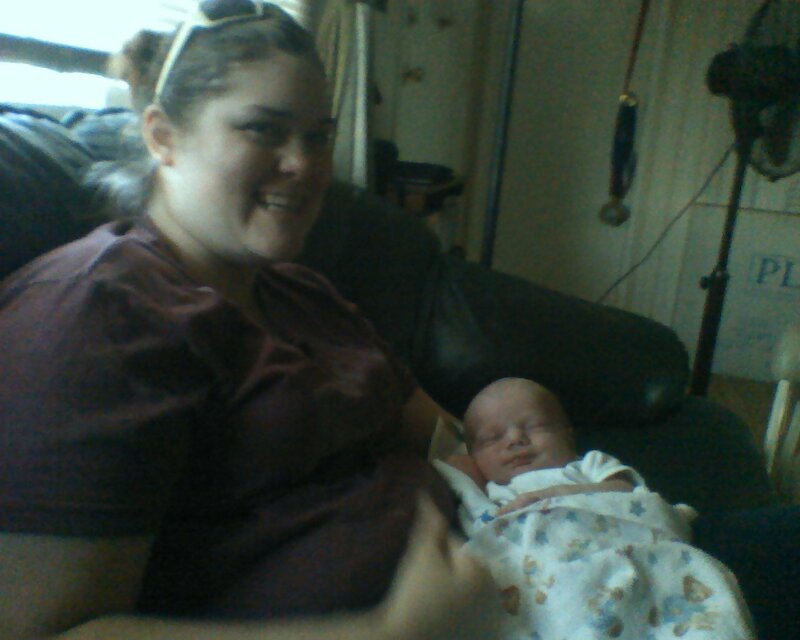 Me and one of my favorite ‘nephews,’ Bjorn, when he was only 12 days old. I love this. I’d call it meditation, but a rose by any other name would still be awesome! In yoga we ask people to visualize flexibility, health, life free from cancer. In childbirth we visualize our cervix opening- but I can’t say I felt that really worked for me. I need to do more of this to find calm and purpose in my life. I’m sure I could learn a lot if I practiced yoga daily like I always mean to. Too many things, not enough time. A friend who teaches ritual design points out that many times, you need to let go of HOW, and just work towards the result you want. I think you are showing wisdom in this approach. Omg, you brought tears to my eyes. You’re a talented writer Kristin.